RFID contactless card is a plastic or paper card which is embedded with a microchip and antenna inside. 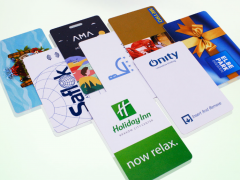 RFID card is widely applied as access control card, employee ID card, hotel key card, parking card, etc. We can offer you both blank cards and cards with artwork printing. Dual frequency RFID card is also available on request. Besides, Vando provides programming and encoding services which exactly fit customer’s programming or encoding requirements. We will offer you various RFID products with super quality, cost-effective price and fast delivery. - 125KHZ Chip: EM4100, EM4200, EM4102, TK4100, GK4001, EM4305, EM4550, T5577, HITAG 1, HITAG 2, HITAG S 2048, etc. - 13.56MHz Chip: Mifare 1K S50, Mifare 4K S70, F08, Mifare 1k/4k compatible, Mifare MINI S20, Mifare Ultralight, Mifare Ultralight C, I CODE SLI, Mifare Desfire 4k, LEGIC MIM256, TI2048, Mifare Plus 2K, Ntag213, Ntag215, Ntag216, etc. - 860-960Mhz Chip: Alien H3, Monza R6, etc.